First, a BIG THANK YOU to my thousands of loyal subscribers, readers and clients! As you may remember, I was nominated for DotComSecrets, Inc.’s “Network Marketing Coach of the Year” during a few months ago. I was up against some stiff competition and “big names” in the industry…so your support, and this award, mean a lot to me. And more importantly, it means the techniques and strategies I teach not only resonate greatly with all of you…but they flat out WORK! I’ve got some great “thank you” surprises in store for you over the next few months so stay tuned! Also, as you many of you know, my background and passion are in the performing arts world…so I’m always very busy catching as many shows and events as possible (also in discussions to be involved in a new Broadway show by the composer of the Tony Award-winning Wicked). I just saw a world premier play at the world-class Arena Stage and some new musicals at DC’s Signature Theatre (where I’ve worked on the creative team and as a performer). Plus this past Thursday night, I took my Dad — as a birthday surprise — to the Kennedy Center to see Billy Crystal get honored with the 10th Annual Mark Twain Prize for American Humor. The presenters at the live event ranged from Whoopi Goldberg, Robin Williams and Jon Lovitz, to Martin Short, Robert Deniro and Danny DeVito. (And even Joe Torre made a surprise cameo). Also – for those of you who are fans of the hit TV show 24 (and you all should be! )…I was able to catch Mary Lynn Rajskub (she plays the big star “Chloe” on 24) do her brilliant standup act last weekend here in Virginia. She’s so cool and down-to-earth that she came out to the bar after the show and did some tequila shots and had some beer. Here’s a picture in the bar post-show (yes that’s her beer behind her). If you get a chance to see her show (and can handle some “colorful” language), I highly recommend it! I laughed nonstop for 90 minutes. And next week I’m off to Disney World again in a couple weeks (just in time for Halloween). I’m pretty excited because this time we’re staying at Disney’s flagship resort, the Grand Floridian Resort and Spa…so it should be a very fun time! P.S. – Stay tuned for an update on our annual free Halloween live event happening NEXT WEEK, October 23. It’s bigger and bolder than ever this year, with a special charity tie-in. More details to come later this week. P.P.S. – Did this article resonate with you? Love it? Hate it? Click COMMENTS at the end of the article and post a comment and let me know!! Let’s face it. In the traditional prospecting equation there’s always one major bottle neck…YOU. No matter how good you are at prospecting and recruiting for your business or how bad you are at it (and I’ve been there before), your personal results are always tied to how many prospects you speak with and how many people you sign up and how many times you made an exposure that day. Unfortunately, most companies only teach you the “traditional” way which relies on still, to some degree, trading time for results. True, you have duplication in your team — and that’s always something to be put in place — but you should not be relying on your team to provide all of your profits. It’s always dangerous to put your income 100% in the hands of someone else, regardless of what industry or business you’re in. That’s why for years, I’ve been teaching direct response-based prospecting strategies that put you in the driver’s seat. Strategies that allow you to truly leverage and profit from the work that you do just one time (read: autopilot). With solid marketing techniques like sales letters and good copywriting, you remove yourself from the equation. You can ratchet up your leads, prospects, recruits and sales practically anytime you want. Copywriting is hands-down the most critical marketing skill you’ll ever learn. It’s a powerful, powerful skill. Another reason copy is important for you and your business is because 99% of the companies out there provide crappy copy and marketing pieces. All of their tools focus on pretty, flashy presentations. Their websites have 17 different things on it that aren’t focused and confuse your prospects. And the tools are just all over the place because they’re not focused on *good* copywriting, which is essentially good salesmanship. So what’s the most important thing copywriting gives you? Now let’s think about it. A sales letter is the most powerful master prospector you could ever hire. For about the price of a cup of coffee (or really just the cost of turning on your computer if you’re using email and doing it online), it will relentlessly go out and deliver your message perfectly every time. It’s never going to call in sick. It’s never going to complain. It will never quit on you or go into the witness protection program like a lot of people in downlines like to do. Simply put, a powerful sales letter is like having a little automatic money making robot working for you tirelessly, day and night, 24 hours a day, 7 days a week. Plus, there’s no rejection. You don’t ever have to feel silly or dumb because sales letters will go out and recruit, sell and do all the talking for you 24 hours a day. And a good piece of copy is specifically designed to uncover the exact people that are interested in your prospects, your services, your opportunity. You’re never going to have to talk to anyone who’s not interested again. Plus, using copy puts you back in the driver’s seat. It’s important for everybody to know, that you don’t own anything in network marketing. You’re basically still working for another company, just on your own terms and schedule…. You don’t own the company, you don’t own the downline, you don’t own the marketing materials, you don’t own the products, you don’t own the services, you don’t own the websites, you don’t have any assets at the end of the day, so if something happens, you don’t have any wealth building assets under your control. So it’s important that you have marketing pieces and marketing systems to deliver prospects to you that are under your control (like copywriting does) because that’s when your wealth and your income become stable. If your company disappears tomorrow or the FCC doesn’t like their marketing or God forbid some Jack Bauer 24-style moment happens to you and you can’t go out and prospect anymore….if you have systems like this in place, then you’re going to be in a position that’s much more powerful and much more stable. Now if you’re skeptical about this working in your business, here’s your answer: You would not be here right now reading this if sales copy did not work. Truth be told, everything that you saw to get you to this point right now was all good copywriting. And when you start using this tool in your business, prospects will literally start raising their hands, wanting what you have…without you even being there! Note: If you’d like to reprint this article you have permission to do so as long as the copyright information and the resource box below remain with the article. WOW! This is the first time I have read one of your articles. Watch out world, here I come with “copy”. I can’t wait for the next article to come into my email. I also agree that the series “24” rocks! Hey Chris – I didn’t know you were a Hokie fan! I graduated in ’03, and now live in Christiansburg. We’ve got season tickets, so we’ll be at the Miami game too! The BC game next week is going to rock. We should hook up for coffee sometime when you’re down here. I am a man of few words.GREAT!!!!!!!!!!!! In today’s competitive marketing world, all network marketers must become better. Learning everything possible about writing good copy is manditory, and your Instant MLM Sales Letters is a great place to start! Congrats on the award and stay in touch! to you earlier, you only one of Two Internet Marketers who use the Time Honored method of communication to your Customers…The USPS. Since being on line my businesses grow form using all venues of Communication. Congrats to the 2007 Network Marketing Coach of the Year! Great insight! Most systems work but not all people work the systems they are on – so you get all these MLM wanna bees switching system to system until they finally realize where the problem is. Hi Chris! I loved the title you gave to this article and even more the background and main idea: If you are not able to communicate your ideas properly, you are hardly ever going to make them happen! Offline or Online is the same, but, you are right about the convenient diference on having your own Sales Robot to do the dirty part of the deal when it comes on saling your services or products with the proper words in that Copytext. Congratulation on your recent recognition as the Network Marketing Coach of the Year. I have read and listen to some calls between you and Downline Duplicator Specialist James Grandstaff and I am really looking forward on personally meeting you sometime next year. Have a Great time at Disneyland (staying at the Grand Floridian Resort and Spa should help) and take care. hi , i like MLM business . Chris , you are very usefull at this time ! Leverage is what makes your business more than just you. I like to think of my sales letters and autoresponder messages as little Paul-clones, going out into the world so that I don’t have to do it myself. Do the work once and benefit again and again. Congratulations on your recognition, Chris, it is well deserved. Thank you so much and congratulations on being Coach of the Year. You did a fantastic job at that webinar. Keep the juice flowing …we’re lovin’ it. Congratulation for you are the coach of the year. Great lessons to pck up from your teaching and mentoring. your blog, newsletters, articles, and everything else I find of yours in my mailbox. I can say that you really are about “quality” and I totally respect that. just as good. Heck! Who am I kidding?! I hope to be EVEN BETTER, if that is at all possible! I like to run with champions. I couldn’t agree more about the power copywriting can have. PS: Congratulations on being awarded MLM coach of the year. Awesome tips, I will be using them on my new venture, I am just starting my first Network Marketing venture. This column was very informative. Kudos to the writer. I think that the only true way for any of us to really reach our business goals, and goals in life for that matter, is by coming together as community and helping one another. The power of community is remarkable. By being part of one that consistently contributes information to one another you multiply your efforts by tenfold. The saying it “ it takes a village” applies to more than just raising children. I for one love nothing more than to help someone get one step closer to reaching their dreams. It gives me a sense of contribution that makes feel OK about staying up long hours day and night researching the latest techniques and tricks to have a successful business and draw people to it. To me the biggest bottleneck is anything that slows me down from bringing more people into my various businesses. It is maintenance and that does not pay. I recently discovered a copmany that actually pays me for prospecting and managing all my businesses in their single global business suite. PRETTY COOL!!! 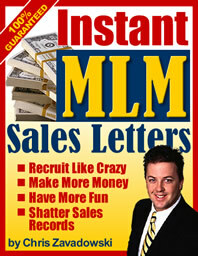 I am planning to get your ‘instant mlm sales letters’ for a direct mail marketing campaign in Australia… keep up the great work !! Thank you so much and congratulations on being Coach of the One Year. You did a fantastic job at that webinar.